Your title says Tribute page help, but you have not explained in detail what help you need. Also, we would need to see your existing Tribute page code to understand your explanation of what the problem is. Preferably, you would provide a Codepen or JSFiddle link to your code. hi so far this is my coding for my tribute page. like i need to know where did i go wrong, then i will fix it. all my errors, then what to do next once i have corrected my mistakes. how do i go about creating a link and how and where do i submit it!. 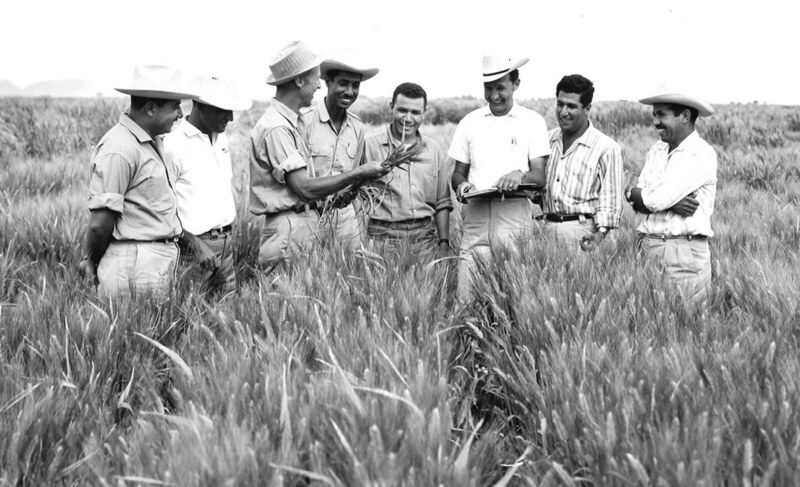 Dr. Norman Borlaug, second from left, trains biologists in Mexico on how to increase wheat yields - part of his life-long war on hunger. <li><strong>1933</strong> - Leaves his family's farm to attend the University of Minnesota, thanks to a Depression era program known as the "National Youth Administration"
<strong>1935</strong> - Has to stop school and save up more money. Works in the Civilian Conservation Corps, helping starving Americans. "I saw how food changed them", he said. "All of this left scars on me." <strong>1938</strong> - Marries wife of 69 years Margret Gibson. Gets laid off due to budget cuts. Inspired by Elvin Charles Stakman, he returns to school study under Stakman, who teaches him about breeding pest-resistent plants. <strong>1941</strong> - Tries to enroll in the military after the Pearl Harbor attack, but is rejected. Instead, the military asked his lab to work on waterproof glue, DDT to control malaria, disenfectants, and other applied science. <strong>1944</strong> - Rejects a 100% salary increase from Dupont, leaves behind his pregnant wife, and flies to Mexico to head a new plant pathology program. Over the next 16 years, his team breeds 6,000 different strains of disease resistent wheat - including different varieties for each major climate on Earth. <strong>1953</strong> - crosses a short, sturdy dwarf breed of wheat with a high-yeidling American breed, creating a strain that responds well to fertalizer. It goes on to provide 95% of Mexico's wheat. @W_E_l_C_O_M_E In the future, please don’t ask questions related to your own project on a thread which was related to someone’s else’s project. It is always best to create your own topic, so you can have your own thread for discussion and does not disrupt or add on unrelated discussion to the original topic’s thread.